Schools, Night Clubs, Weddings etc. Jayne@ Robins Taxis of Watton can draw on many years experience in the Private Hire trade in and around Watton to provide a very high standard of service throughout the eastern region, with particular emphasis on airport transfer work. Whether you are a business or leisure traveller, Jayne@ Robins taxis are the competitive solution for airports, seaports, Eurotunnel and London or other major cities as well as local trips. Estate vehicle: These vehicles can accommodate up to four passengers with four pieces of luggage. Jayne@ Robins Taxis in Watton will provide clean, quality vehicles as standard. All vehicles are local authority tested at least twice yearly, so you can be assured of the highest standards of safety and comfort. Jayne@ Robins Taxis is a family run company in Watton. 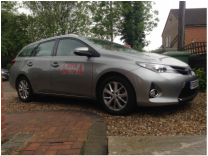 We have 4 years experience in the taxi trade and have been local to the area for over 20 years. The drivers undergo both police national computer and enhanced level criminal record bureau checks. Located in Watton and are fully licenced under Breckland Council area. We are also badged through Norfolk County Council to work with children and vulnerable persons of all ages. We also have available a passenger assistant who is first aid trained and is available to accompany passengers throughout the trip and hospital appointments. All vehicles are extremely clean, welcoming and very well looked after. We operate a child friendly service and this stretches also to pets. We can even offer a "shop with you service" where we can pick you up from your location, take you to where you require and accompany you on your trip to assist you. Please allow us time to read and respond to your enquiry, also you you can call us.